I visited Christ Community Lutheran School in Webster Groves, Missouri yesterday (Friday, 2/1/2013). I spoke with students in grades Kindergarten through 4th, and afterward we took a tour of the school. The teachers designed amazing bulletin boards inspired by my books, and the students did a fantastic job creating the art and writing stories. 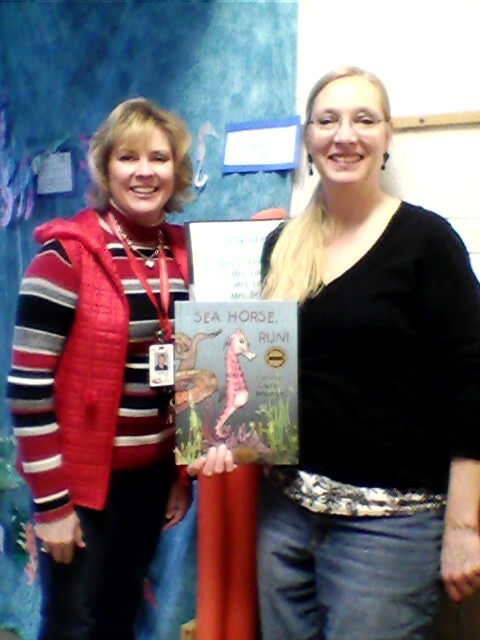 Our tour guide and the primary organizer of our author visit was the 1st grade teacher, Ann Schmidt. 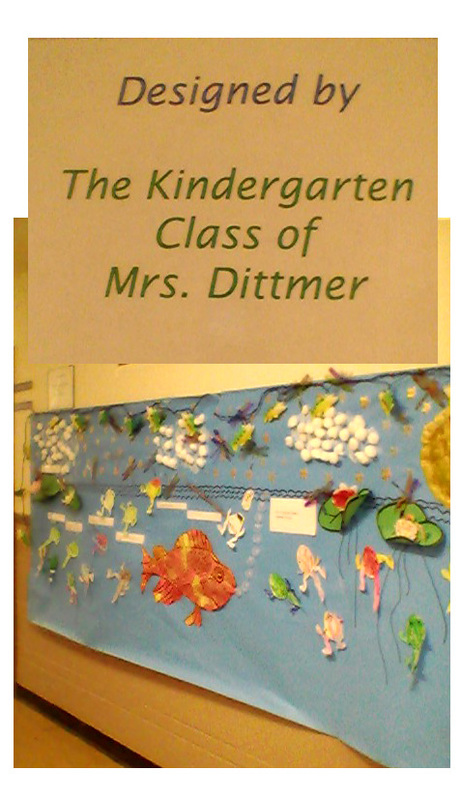 Her bulletin board featured the students’ favorite book, TINY SNAIL (above). Arrival and set-up: 9:15 – 9:35 am. 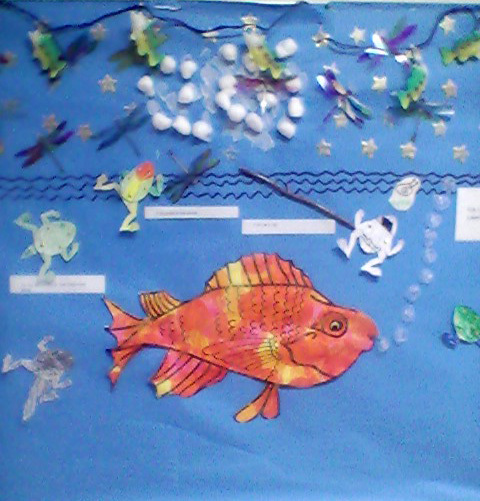 Designed by Mrs. Dittmer’s kindergarten class, this bulletin board based on POLLIWOG illustrated the pond above and below the water. 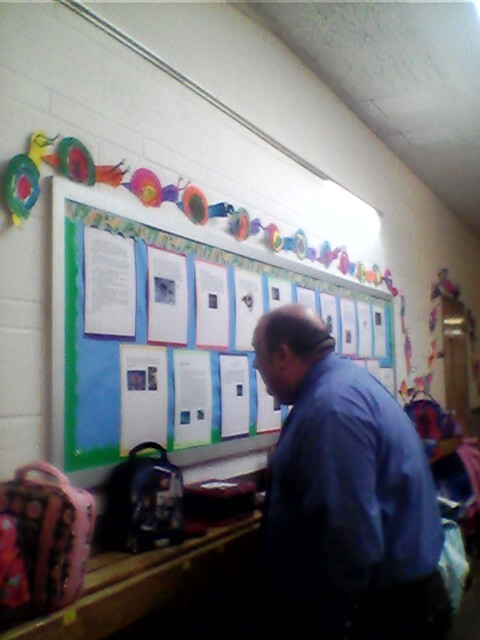 Below, many students wrote stories, and a trail of brightly colored snails marched up and around the bulletin boards. 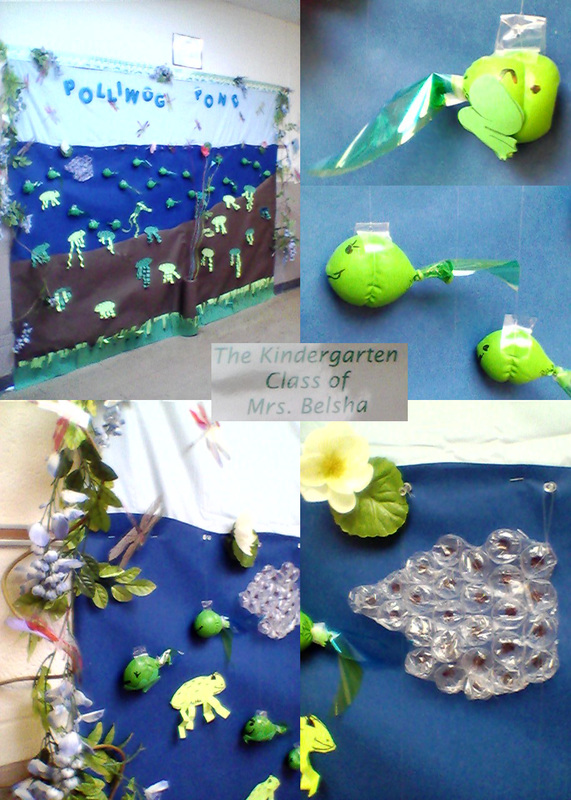 The “Polliwog Pond” below was created by Mrs. Belsha’s kindergarten class. This bulletin board was covered with tadpoles made from balloons. The tadpoles were at various stages of their transformation. They even created frog eggs from bubble wrap! 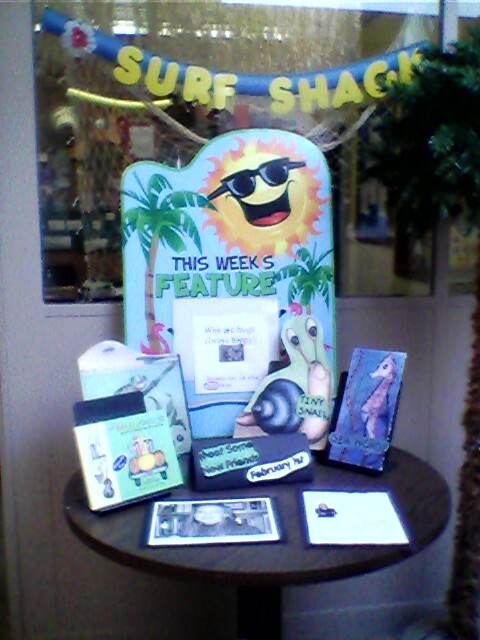 The “Surf Shack” was the reading specialist’s room, and the entrance featured a table highlighting my books as this week’s feature. 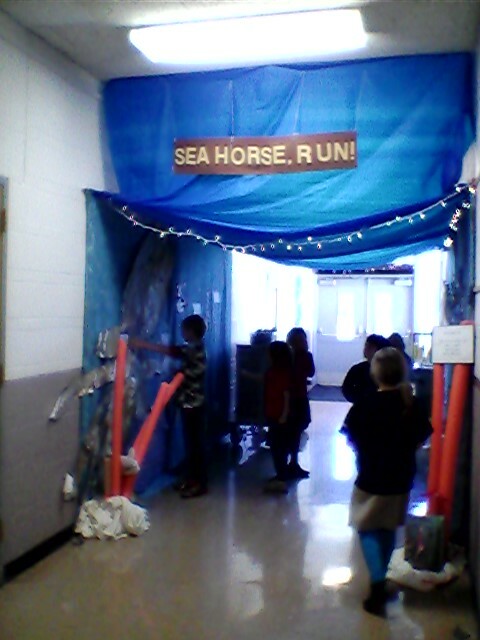 The most elaborate design was based on SEA HORSE, RUN! and created by three classes of 2nd grade students (Mrs. Ladd, Mrs. Brown, and Mrs. Leet). The display gave the illusion of walking through a glass tunnel at an aquarium. 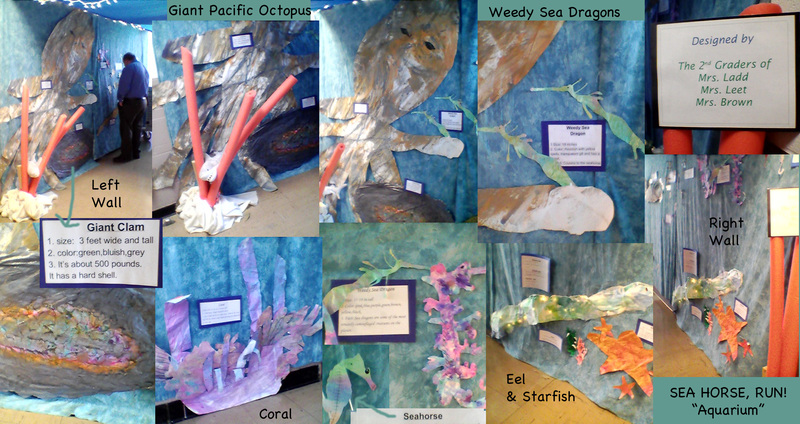 The walls and ceiling were covered in a cloth that mimicked water, and the collage of sea creatures were designed to scale by the students. Mrs. Karen Brown (left) and Mrs. Marcia Ladd (right) are pictured below. The next montage of pictures contains closeups of this elaborate bulletin board. The eel has christmas lights inside so he lights up, and the red coral ‘growing’ out of the floor was made from swimming pool noodles. So creative!!! A big thank you to the students and staff of CCLS for making my first author visit of 2013 so memorable. I can’t think of a better way to start the new year!